How Parisians Did "Guillotine Chic"
The Revolution and the Terror devastated French society, and then receded. In their place they left a weird, chaotic society with a very strange form of chic and an even stranger form of fashionable lady. 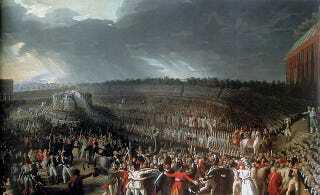 The French Revolution was kickstarted by food shortages, but political change failed to supply people with bread. Wars against foreign powers shrank the food supply and the supply of food producers as both were sent off to the army. People began standing in bread lines at midnight and rioting at dawn. At one point, Parisians were regularly being torn apart by dogs. Paris had been one of the political hot-beds, where a single denunciation could lead to entire families being hauled off to be imprisoned, given a mass trial, and executed. Many people kept dogs, and the most-likely targets of the Terror were rich and kept hunting dogs. When people died or fled, their dogs were released into the streets, where they starved, formed packs, and started looking for food. It got so dangerous that the government sent out soldiers to hunt down and kill the dog packs, and wagons to haul away the piles of bodies. Gangs roamed the streets. At first they were pro-Revolutionary gangs who attacked the aristocratic, but as the balance of power shifted, they became gangs of anti-Revolutionaries who attacked the sans-culottes. The currency collapsed, and so people bartered, often with items they'd stolen from the houses of those who had been executed. Post-Terror, everything was still up in the air. No one knew what political system they would face tomorrow, but they still wanted to have a good time and look cool. Most notoriously — and perhaps fictitiously — the "victim chic" resulted in "les bals des victimes." These super-exclusive social events were said to include only ex-prisoners or the family members of the executed. Everyone wore the red ribbon, and bowed their heads as if they were being guillotined when they came in the ballroom. Today, historians question whether these social events ever really took place. I hope they did. If someone gets released from jail with a bad haircut and has to battle street gangs, bread riots, and packs of feral dogs, they should at least get a party out of it.